A very special episode of Radio Free Charleston is online now. On January 25, Ric Cochran and Friends staged a concert at the La Belle Theater in South Charleston to raise awareness and money for the Sojourner’s Shelter for Homeless Women & Families, a program of the Charleston YWCA. It’s a great cause and it was a great night. This was the night of the infamous “blue haze” that scooted across the county, and despite that, a large crowd turned out to hear music from Ric Cochran and his many friends. I had planned to be on hand to record Rich Allen for the show, but I wound up recording most of the night, and decided to turn it into two episodes of Radio Free Charleston. There was just so much great music, and it’s for such a good cause that I figured it was worth using RFC to help raise awareness, instead of doing our usual confusing Avant-garde goofiness. This week we’re bringing you the first episode, featuring Rich Allen, John Lilly, and Sean Richardson and Karen Allen (with Deron Sodaro, Jerry Fugate and Mark Davis). Next week we’re going to hear from Margaret Taylor, director of the Sojourner’s program for the YWCA, and Ric Cochran, who organized the event. We’ll also here more music from the evening, including The Synergy Collective, and an all-star finale. So this is a departure episode for RFC. We’ve put the animation and comedy on hold, and focused on the music. 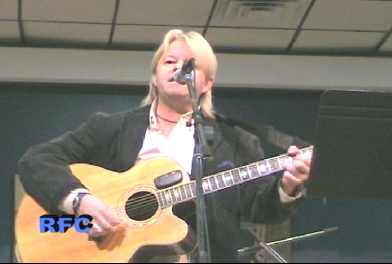 And the musical performances were shot with one camera, instead of our usual multiple-camera video extravaganzas. This was due to the blue haze scaring off my extra camera operators, but it worked out for the best because it allowed me to capture the entire evening on tape. The single-camera look lends a “cinema verite” feel to the show as well. The YWCA Sojourner’s Shelter for Homeless Women and Families is a 75-bed emergency shelter program that provides a safe place of refuge 24 hours a day, 365 days per year to homeless single women, women with children and intact families which are comprised of a married couple with or without children or a single man with custody of his children. For details on how you can volunteer or donate to Sojourner’s, check out this page. 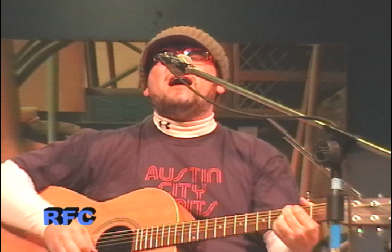 Rich Allen performs his song “She’s Crazy” on the show. As I mentioned above, Rich was the reason I took the RFC cameras to the La Belle that night. I’ve been wanting to get him on the show for a few weeks, since hearing him at the Lighthouse Cafe back in November. Rich is also a filmmaker, and we’ll be showcasing some of his short flicks on Radio Free Charleston starting in just a few weeks. 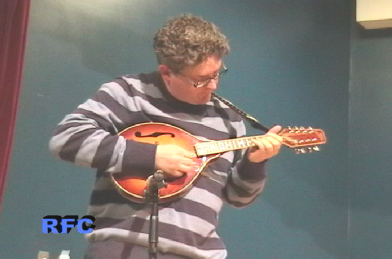 John Lilly is the esteemed editor of Goldenseal Magazine, and is also a true West Virginia musical treasure. “I’m a Roadkill on the Highway of Your Heart” had the La Belle audience in stitches, and had to be included on this show. I left in John’s introduction, which is usually something I don’t do on RFC, because it was just so funny. Sean Richardson and Karen Allen and Friends (Deron Sodaro, Jerry Fugate and Mark Davis) perform “The Apple Don’t Fall Too Far From The Tree.” This is far from the first appearance by any of these fine musicians on the show. 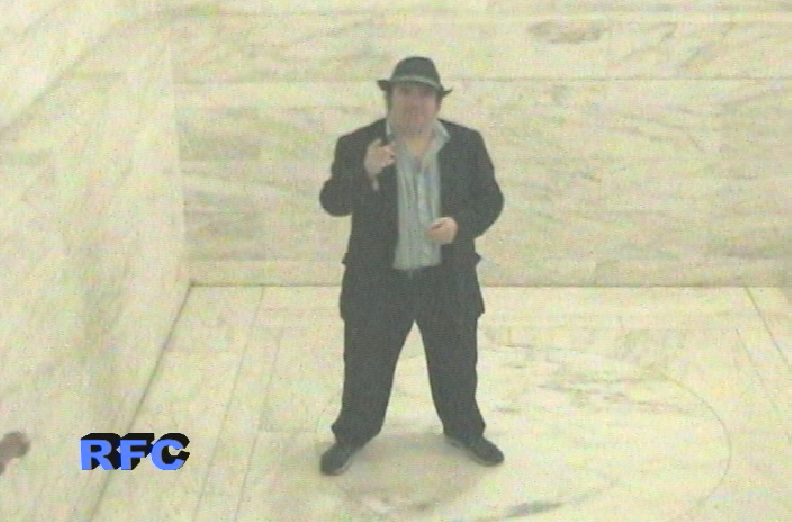 Sean has been on RFC as a member of The Sleeping Dons, as a solo artists, as a filmmaker, and as a robotic Kaiju. Karen is the lead singer of Whistlepunk. Deron Sodaro has been on RFC swinging his mighty bass guitar with The Sleeping Dons, Mother Nang, The Voo Doo Katz, and Comparsa. 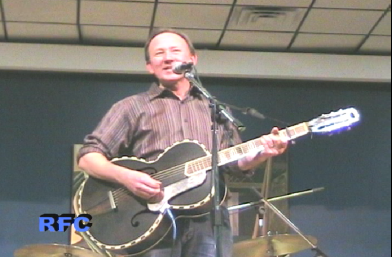 Jerry Fugate, along with John Radcliff, treated us to a mandolin rendition of the Radio Free Charleston theme song in our Parkersburg road trip show and ran camera two for the Feast Of Stephen reunion show. Mark is the “newbie” of the groups, RFC-wise, having only been on twice before, with The Voo Doo Katz and Comparsa. The host segments were shot last Sunday at the State Capitol. We’d planned to shoot on the steps outside the capitol building, but the winds were too fierce, so we had to sneak inside and shoot in the famous rotunda. Working inside a dome that’s lined with Marble did not make for the ideal audio situation for my voice, but I think it came out looking pretty cool. Next week we’ll be back with part two of our shows documenting this special night. Check back here for more detailed production notes about that night, too. It looks like that was a wonderful evening of music, for a great cause. I’m glad you allowed those of us who missed it to experience some of it.